FOR USE WITH GARAGE DOOR OPENERS MANUFACTURED AFTER JANUARY 1, 1995. 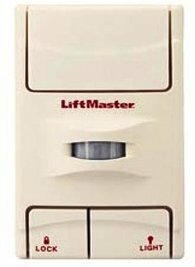 This door control contains a motion detector that will automatically turn on the light when it detects a person entering the garage. This feature can be easily turned off for extended work light use. Includes mounting screws and wall control panel, No wire is included.